India’s mineral deposits: A boon or curse? It is well known fact that minerals are the natural inorganic components of the earth crust (except fossils fuels like coal and petroleum) and found as an integral part of the rocks. They have economic value and considered as the back bone of industries. It is also true that the mineral deposits are limited and cannot be created by humans. India has large deposits of minerals (see box) that go in for value addition to make cement, steel, aluminium, electricity, etc. Mining of minerals and mineral based industries play a major role in the economy in generating direct and indirect employment and adding revenue to government treasury. The journey of minerals from their mining site to the industries and converting into end products seems very straightforward but in Indian scenario is it so? Have the mineral based operations been taking place without hurdle and conflicts? Is central and state policies industry friendly? Is obtaining the mining lease within limited time period possible? There are so many queries and urgent need to evaluate the queries. After extensive paper work and investing lots of time and effort in submitting the lease application, the application is subject to minute scrutiny. In case of major minerals the application is sent for approval to the center. After getting the letter of Intent (LOI) the next step is acquiring the land or the consent for prospecting. If the land belongs to the government then it is easy to acquire but in case of the private or forest land it becomes a very tough task. With private land owners not keen to give their land for the mining purpose the lessee even after acquiring the land is not sure how long the mining operation can be continued. Because after investing a huge fund in the long lease if there is any protest, the operation gets stopped by the government. Moreover, the companies have to conduct a public hearing under the guidelines of Ministry of Environment & Forest (MoEF) as well as the state pollution control board. This public hearing is chaired by the district collector along with other government officials and near the location of mining. On the basis of successful public hearing where locals give consent to start the project, the proposed project is approved by the government. In return, land owners are paid compensation for the land, care is taken for providing local employment (both direct and indirect) and also for contributing towards the CSR activities in and around the areas. But the main conflicts here are between the environmentalists and the mining companies. Environmentalists are concerned about the environment degradation due to pollution. In addition, NGOs also come forward to protest the mining by highlighting the local issues which are affected by the mining. Sometimes the protest against the mining becomes so widespread that the conflicts converts into a legal battle and ultimately by the order of either the High Court or Supreme Court the mining is stopped. There are so many cases in Orissa, Jharkhand, Goa, Rajasthan, Andhra Pradesh etc where mining activities has stopped resulting in adverse affect on employments as well as huge loss of government revenue. Now after this exertion it seems possible to look at mineral deposits in India as a curse. In contrast the time has come to think over it and take concrete steps to keep the mining industries alive. The government must take initiatives to look after these problems especially related with the environmental parameters. The MoEF has already laid down the guideline terms of reference (TOR ) before providing its consent to operate to the mining industry Similarly, Indian Bureau of Mines (IBM) also closely monitors the mining plan which is submitted by the mining industries. But still there is lack of co-ordination between the environmentalists and mining industries due to which conflicts take place. Therefore, the governments and NGOs must plan a strategy to come out of the conflicts and make mining operation eco-friendly. The situation must be balanced with environmental norms. The lease boundaries must be bordered by the thick plantation to reduce the air pollution and noise pollution and the protection of the surrounding greenery should be on priority list. The tipper carrying the mineral ores for transportation must be covered to reduce the dust pollution. Entire transportation route from mining site to the ore stock yards must be sprinkled with water to suppress dust pollution. There should not be any discharge of slurry or other mining products into the nearby water body to prevent water contamination. In addition, the machinery involved in the mining operation should be maintained from time to time to avoid any oil spilling and reduce noise pollution. The other safety norms under the guidelines of DGMS (Director General of Mines Safety) must be on higher side to avoid any type of casualties. There should not be over exploitation of the minerals and mining should be substantial. Strict action must be taken by the government if any illegal mining activities take place by any mining industries in terms of violating the approved mining plans and EIA (Environment Impact Assessment) report. But sometimes the punishment is also faced by companies who are completely in legal mining i.e., they do not extend their mining activities beyond the approved mining lease area and do not exceed their production capacity beyond their mining plan. And once again as consequence, the entire mining operation gets banned and the employment ratio drops. Such notion must be abolished and the government must always think positively about mining industries because it plays a major role in revenue generation and provides large volume of direct and indirect employment. Moreover, although the state government has notified the mineral bearing area or zone, most of the minerals bearing area either belongs to the private owners or to the forest. Therefore state government must reserve those areas only for the mining and mining base industries activities. In this way, the problems and hurdles regarding land consent can be minimised. In addition, the exploitation and misuse wastage of the minerals can be prevented. A lot of aluminiferous bauxite was mined and utilised in the construction of the roads and bridges while construction of the coastal highway along the Konkan Coast in Maharashtra. Moreover, local residents go for the mango plantation as it is a commercial crops. They remove the aluminiferous lateritic rocks by blasting or drilling in search of the soil and these rocks are then utilised either in constructing the fencing or in construction of houses. So in all the ways it is complete wastage of the minerals and violation of MMDR Act. The rare earth minerals like ilmenite, monazite, zircon, rutile, sillimanite, garnet etc together form massive deposits of about 600 million tones and are found only along the coastal stretches of India not elsewhere, These are a type of placer deposits and generally mixed with the beach sands and available in the intertidal zone. Earlier these minerals were mined easily but after the implementation of CRZ (Coastal Regulation Zone) in 1991, these deposits fall in CRZ 1 category means highly sensitive areas and these areas must be protected from any type of activities. In consideration of the global warming and future rise in sea level it is also necessary to protection the intertidal zone and prevent the beach sand and sand dunes mining activities. But these beach areas are considered very much favourable for tourism and being exploited by the resorts, restaurants, hotels entrepreneurs by violating the CRZ rule. They are easily getting permission from the government to go for these constructions but for mining activities it is a complete refusal by the government. Because of these huge anthropogenic activities coastal areas need to go for Coastal Zone Management Plan too. The reason behind it is that in spite of presence of the heavy minerals in the form of black sands along the coast, the area has not yet been reserved for the mining. The mining of these rare earth minerals may be possible by taking all the necessary steps related with the safety and environment. In case of intertidal zone the impact of the mining activity would not be much prominent as the mined area would immediately reclaimed by deposits by the sea water during high time. But in case of the mining out of the high tide line all the environmental and safety norms has to be followed on priority. In spite of having our own mineral resources, the country is forced to import minerals like coal, iron ore, rock phosphate etc and which affect the market in costing. The prices of steel, cement, crude oil are rising daily and affecting the budget of Indian citizen. Every year numbers of mining engineers, surveyors and geologists get their final degrees from various institutes and universities. It makes no sense to have these courses if there is no opening in the market for jobs in the mining industries. Hence; both the central and state governments, if they wish to keep alive mining and mineral based industries must monitor policies closely for proper implementation.. An awareness program must be conducted among the people about the importance of mining and mineral based industries. This entry was posted in Blog on September 4, 2018 by admin. Today mail as well as letter with attachments send to the Honourable Prime Minister, Other Ministries and the Secretaries to take criminal action against Mr. Dhayadevadas for using company name as Federation and do illegal activities which given below for our members information. Mr. Dhayadevadas was political PA of the Mr. Dhanuskodi Adithan, Ex.Congress Member of Parliament and Ex. Congress Central Minister. They have registered company in the name of Indian Garnet Sand Company, Mr. Dhayadevadas and Mr. Dhanuskodi Adithan and their wife’s were Director of the said company. They also registered a firm in the name of Southern Enterprises and doing illegal mining in a large scale in Tamilnadu, particularly in Trichy District. They are giving trouble to the law obeying companies in the name of Federation of Indian Placer Mineral Industries which is a company registered under Indian company Act. Except his own Indian Garnet Sand and Southern Enterprises non of the placer mining lessees are members in the above said bogus federation. Dhayadevadas use the said bogus Federation name to threaten the officials and to make false complaints against other law obeying companies. Complaints were send to various authorities, when the Honorable Vajbayee was the Prime Minister. The CBI directed the Regional Director of the Company Affairs to take appropriate action. Unfortunately after the BJP Govt., changed, Mr. Dayadevadas influenced the congress government and stop the legal action against him. In fact, no university gave him Doctorate. But he put Dr. before his name to threaten the officials. So for this also, a criminal action should be taken. Dhayadevadas used the photo joined with Ex.Prime Minister and Mr. Dhanuskodi Adithan to threaten the officials and there by prevent them from taking action against him and influenced the officials to act against Indian Exporters, as, he has got huge money from overseas companies for the stoppage of Indian beach Mineral export which is a threat to the developed countries like Australia, South Africa and China etc., Because of Dhayadevadas illegal action, even though India has more than 40% of the total world reserve, our export earning is very meagre while comparing to other countries. In case, the technology is changed the entire mineral wealth will become waste and most of the minerals will be transported to adjoining countries and within India it will be used for domestic purpose such as filling the pits and for construction work etc., Thus the valuable mineral wealth become waste because of the illegal action of Mr.Dhayadevadas. I therefore request the Honourable Prime Minister that, a suitable direction may kindly be given to the CBI to enquire about the nexus between Mr. Dhayadevadas and the overseas companies who are influenced to stop the Indian Beach Mineral Export and the officials who are colluded with this criminal man. If a CBI enquiry is conducted, and the phone statement are verified, you can find out that, officials from Ministry of Mines, as well as AMD and Ministry of Commerce etc., are also colluded with him for this illegal activities. This entry was posted in Blog on August 18, 2018 by admin. ஆந்திராவில் தாது மணல் எடுத்தால் அது சுற்றுச்சூழலுக்கு உகந்தது. ஏனென்றால் அந்த கம்பெனி தொடர்ந்து இந்து பத்திரிக்கைக்கு விளம்பரம் கொடுக்கிறது. தமிழ்நாட்டில் தாது மணல் எடுத்து அது சுற்றுச்சூழல் பாதிப்பு. ஏனென்றால் இந்து பத்திரிக்கைக்கு விளம்பரம் கொடுக்கவில்லை. இது தான் இந்து பத்திரிக்கையின் கொள்கையோ!!! Trimex Sands Private Limited, which is keen on expanding its heavy mineral sand mining business, has approached the State government for the establishment of its project at Bhavanapadu in the district. 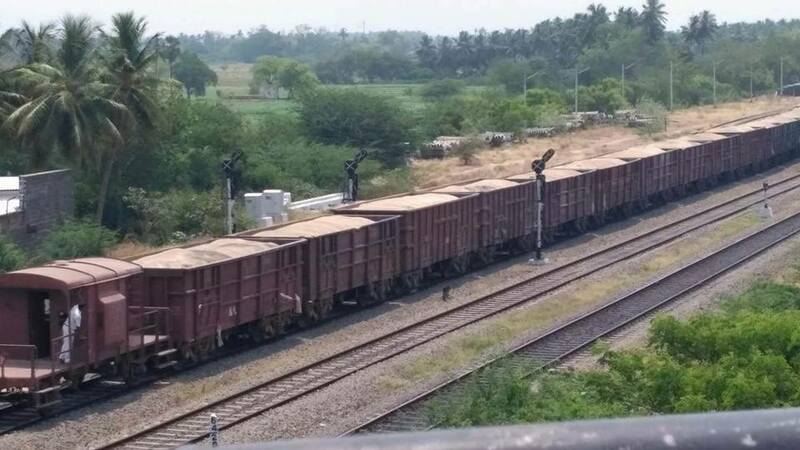 It reportedly submitted a detailed report to the government a couple of days ago contending that that the establishment of the heavy mineral industry in the proposed Bhavanapadu port area would spur economic activity in the backward district and provide employment to more than 1,000 persons. The company plans to invest ₹1,000 crore in the proposed project for which a public hearing was conducted almost five years ago. The company signed a memorandum of understanding with the State government in the presence of Chief Minister N.Chandrababu Naidu during the investment meet held in Visakhapatnam last year. Minerals such as ilmenite, rutile, zircon, garnet, sillimanite which are available in beach sand will be used in many industries, including ceramics, glass-making, painting, and jewellery. They are mainly being exported to China, Japan and European countries. “Beach sand mining is absolutely eco-friendly and that is why, all the countries are encouraging the business. After processing and extraction of minerals, the sand will be dumped again in the same place, ” Koneru Pradeep, Managing Director of TSPL, told The Hindu. “Our existing plant at Vatsavalasa of Srikakulam district is absolutely eco-friendly. That is why we are able to garner the support of locals. To help local youngsters, we will give top priority to them in providing employment in the Bhavanapadu project too,” he added. According to him, the company has got statutory licences from the Department of Atomic Energy, the Atomic Energy Regulatory Board, the Coastal Regulatory Zone Authority (CRZA) and other agencies. “The AP government is quickly processing applications under the ease of doing business policy. We are hopeful of getting statutory licences and permissions from the government soon,” said Mr. Pradeep. This entry was posted in Blog on August 11, 2018 by admin. already allowed in the Coal Ministry. orders for it,” Steel secretary Aruna Sharma said here. are working together in this regard. “I totally endorse the single window system….We can’t afford . for general exploration of these 288 mining leases. due to expiry of these leases. This entry was posted in Blog on August 10, 2018 by admin. ஏழ்மை நாடுகளின் வளர்ச்சியில் சுரங்க பணி பெரும் பங்கு வகிக்கிறது. ஏழ்மை நாடுகளின் வளர்ச்சியில் சுரங்க பணி பெரும் பங்கு வகிக்கிறது. சுரங்கம் மற்றும் கனிமங்களுக்கான சர்வதேச கவுன்சில் அறிவிப்பு – ஆம். மனித குல வளர்ச்சியும் முன்னேற்றமும் கனிமங்கள் மற்றும் சுரங்கங்களை வைத்தே நடைபெறுகிறது. இந்த புரிந்துணர்வு தமிழக ஊடகங்களிடம் இல்லாதது துரதிஷ்டமே.. The lives of people living in countries whose economies are dependent on mining have, on average, improved faster than those of people in other countries over the past 20 years, a report by the International Council of Mining and Metals (ICMM) has found. The ‘Social progress in mining-dependent countries’ report, which was published on Tuesday, uses the lens of the United Nations Sustainable Development Goals (SDGs) to determine social progress in mining-dependent countries and finds that most of those countries have significantly improved their social performance over the 20 years leading up to the launch of the goals in 2015. People in the 25 countries that are considered mining-dependent are now generally healthier, better educated and enjoy improved access to affordable and clean energy, waterand sanitation. They also enjoy access to telecommunicationsand financial services, ICMM says. The report showed that people living in these countries are better off in absolute terms and that they outperform countries that are not resource dependent. “ICMM’s experience is that, when we mine with principles, our industry can be a major development driver in some of the world’s poorest countries,” commented ICMM COOAidan Davy. He added that this report challenges the widely held perception that an abundance of mineral resources impedes economic and social progress. Instead, the evidence suggests that social progress in mining-dependent countries over the past 20 years has been stronger than in other countries. However, the report cautions against attributing causality between the prevalence of mining alone and observed social progress. There are other factors at play, including government capacity and policies, quality of governance, economic activity in other sectors, and the effectiveness of social programmes run by the government, the private sector and nonprofit organisations. The report reaffirmed the potentially important contribution the mining sector can make to shaping social progress. The observed gaps in the social performance of mining-dependent countries could also help mining companies and other stakeholders identify priorities for engaging in productive partnerships with host governments, communities and civil society. Of the 25 mining-dependent countries, 21 are closing the gap on best performing countries. The Central African Republic, the Democratic Republic of Congo, Zambia and Namibia, while making progress in absolute terms, are falling behind relative to the world’s best performers in terms of social progress. Overall, mining-dependent countries improved on more than 78% of over 30 metrics that link to 11 of the SDGs, although results were uneven. The report looked at the regional level in four countries: Chile, Ghana, Indonesia and Peru, and revealed that social progress at a sub-national level has been widespread. In absolute terms, mining-dependent regions advanced on three-quarters of social progress indicators. The gap between mining-dependent and the best performing regions narrowed in all four of these countries. In Ghana, both mining-dependent regions closed the gap on best performing regions, while 93% of Peru’s and 80% of Chile’s and Indonesia’s mining-dependent regions made similar strides. This entry was posted in Blog on August 3, 2018 by admin. இந்திய தாது மணல் தொழிலுக்கு எதிராக எழுத என்று பல கோடி ரூபாய் கைமாறி உள்ள நிலையில் பல்வேறு முக்கிய நிலைகளில் உள்ள நபர்களும் ஒரு சேர கூட்டணி அமைத்து இந்த தொழிலுக்கு எதிராக திட்டமிட்டு பொய் பிரச்சாரம் செய்து வருகிறார்கள். ஜீனியர் விகடன் பத்திரிக்கையும் அதில் ஒரு அங்கம். அவர்களுக்கு 15 முறை எழுதுவதற்கு என்று 50 லட்ச ரூபாய் சினிமா படம் எடுப்பதற்கு பைனான்ஸ் என்ற பெயரில் கொடுக்கப் பட்டதாக சில மாதங்களுக்கு முன்பே தொழிற்போட்டியாளர்களால் செய்தி கசிய விடப்பட்டது. அதனை உறுதி படுத்தும் வகையில் உலகின் எந்த மூலையிலும் அணு ஆயுதம் அல்லது அணுசக்தி மூலப்பொருளாக உபயோகப்படாத மோனசைட்டை அணு ஆயுத மூலப் பொருள் என்று ஒரு கொடும் தலைப்பிட்டு செய்தி வெளியிட்டு உள்ளார்கள். எங்கள் காது படவே அந்த செய்தியை படித்த சில நடுநிலையாளர்கள் ஜீனியர் விகடன் இவ்வாறு பொய் செய்தி எழுதி பிழைப்பதற்கு பதிலாக நவீன விபச்சாரம் செய்யலாம் என்று விமர்சனம் செய்ததை கேட்டோம். இதுவே எங்களுக்கு நடுநிலையாளர்கள் உண்மையை தெரிந்துள்ளார்கள் என்பதை நிரூபித்தது. இருப்பினும் நாமும் அதற்கு ஆட்சேபணை அனுப்பி உள்ளோம். வழக்கம் போல் அவர்கள் இதனை வெளியிடப் போவது இல்லை. எனவே அந்த ஆட்சேபணை மின் அஞ்சல் கீழே கொடுக்கப் பட்டுள்ளது. தாது மணல் விவகாரம், அணு ஆயத மூலப் பொருள் என்ற தலைப்பிட்டு தாங்கள் எழுதிய 2-வது பாகத்திற்கும் எங்களது ஆட்சேபணையை தெரிவித்துக் கொள்கிறோம். உண்மையில் உலகின் எந்த மூலையிலும் மோனசைட் அணுகுண்டு உற்பத்திக்கோ, அணுமின்நிலைய உற்பத்திக்கோ பயன்படுத்தப்படுவதில்லை. இதில் இருந்து கிடைக்கும் தோரியம் கதிர்வீச்சு உள்ளதே தவிர பிளவுபடும் பொருள் (களைளடைந) அல்ல. எனவே அதனை எந்த காரணத்திற்கும் உபயோகிக்க முடியாது. நாளது தேதியில் உலகின் எந்த நாட்டிலும் இந்த மோனசைட்டில் இருந்து கிடைக்கும் தோரியம் அணுமின் நிலையத்திற்கோ அல்லது அணுகுண்டு செய்யவோ உபயோகப்படவில்லை என்ற விபரத்தை ஏற்கனவே கடந்த 02.07.18 அன்று தங்களுக்கு அனுப்பிய மின் அஞ்சலில் தெரிவித்து இருந்தோம். இருப்பினும் கூட எங்களது ஆட்சேபணையை பற்றி ஒரு வரி கூட தெரியப்படுத்தாமல் பொய்யை மெய் போல் திரித்து கூறி இரண்டாவது பாகத்தை வெளியிட்டு உள்ளது பத்திரிக்கை தர்மத்தை மீறியதும் பத்திரிக்கை சுதந்திரம் என்ற ஆயுதத்தை உங்கள் சுய லாபத்திற்கு தவறாக உபயோகிப்பதும் ஆகும். இது சம்பந்தமாக நாங்கள் எந்த அதிகாரிக்கு புகார் செய்ய வேண்டும் என்ற விபரத்தையாவது தயவு செய்து வெளியிடுங்கள். நாங்கள் புகார் செய்கிறோம். தாங்கள் தோரியம், யுரேனியம் என கூறி விட்டு நேரடியாக தாது மணலுக்கு வந்து விட்டீர்கள். அதே போல் தாது மணல் என குறிப்பிட்டு வழக்கம் போல் தங்களது தாக்குதல் முழுவதும் விவி மினரல் நிறுவனத்தின் மேல் தான். விவி-யை தாக்குவதற்காகவே இந்த செய்திகளை திரித்து எழுதி வருகிறீர்கள். உண்மையில் சாகு கமிட்டி அறிக்கையில் விவி நிறுவனத்திடம் உள்ள மோனசைட் இருப்பு சரியாக இருப்பதையும், தாது மணல் இருப்பு சரியாக இருப்பதையும் குறிப்பிட்டு இருந்தார். இதர சில நிறுவனங்களில் தான் கணக்கை விட கூடுதல் இருப்பு இருப்பதை குறிப்பிட்டு இருந்தார். ஆனால் விவி-க்கு எதிரானதை மட்டும் எடுக்க வேண்டும் என்பதால் தாங்கள் அமிக்கஸ் அறிக்கை என ஒன்றை குறிப்பிட்டு எடுக்கிறீர்கள். அந்த அமிக்கஸ் அறிக்கை என்பது விவி நிறுவனத்தோடு 1996 முதலே சேரன்மகாதேவி சார் ஆட்சியராக இருந்தது முதலே பகைமை கொண்டுள்ள திரு.ககன்தீப் சிங் பேடியின் ஒரு தலைபட்சமான அறிக்கையின் அடிப்படையிலும் ஆற்று மணல் தொழிலை பற்றி பேசாமல் இருக்க உங்களுக்கு சினிமா படம் எடுப்பதற்கு 5 கோடி ரூபாய் தந்த முந்தைய அரசின் நிழல் உலக அதிகார மையத்தின் உறவினர் கருணாகரனை ஆற்று மணல் போல் தாது மணலை சுவாகா செய்ய என்று திருநெல்வேலி கலெக்டராக நியமித்து ஒரு தலை பட்சமாக தயாரித்து வாங்கிய அறிக்கை. உயர்நீதிமன்றம் ககன் தீப் சிங் பேடியின் முன்விரோதத்தை ஒப்புக் கொண்டு வேறு மாநில உயர்நீதிமன்ற நீதிபதியை ஆய்வு செய்ய நியமித்தது. அப்படியானால் தங்கள் திட்டம் நிறைவேறாது என அரசு மேல்முறையீடு தாக்கல் செய்து இடைக்கால தடை பெற்றது. இதில் இருந்தே இதன் உள்நோக்கம் தெரியவில்லையா? பேடி அறிக்கையை வெளியே தெரிவிக்க கூடாது. பேடியின் நியமனம் சரியா என உயர்நீதிமன்றம் டிவிசன் பெஞ்ச் முடிவு செய்யும் வரை பேடி அறிக்கையை ஒட்டிய கவரில் பாதுகாக்க வேண்டும் என குறிப்பிட்ட நிலையில் பேடி அறிக்கையின் அடிப்படையில் அமிக்கஸ் தயாரித்த அறிக்கை தங்களுக்கு யாரால் தரப்பட்டது. அதை அமிக்கஸ் தந்தாரா அல்லது நீதிமன்றத்தில் திருடினீர்களா? அல்லது சான்று நகல் பெற்று எடுத்தீர்களா? எப்படியாயினும் கனிம நிறுவனங்களை வைத்தே விகடன் நிறுவனம் வளர்ந்து வருகிறது. ஜீனியர் விகடன் வளர்ச்சியாக ஒரு சட்டப்படியான தொழிலை உண்மைக்கு மாறான செய்தி மூலம் தாக்கி வருவது அதுவும் நீதிமன்றத்தின் கவனத்தை திசை திருப்ப இவ்வாறு பொய் செய்தி வெளியிடுவது நியாயமா என்பதை தயவு செய்து சிந்தியுங்கள். இந்த நிலையில் ஏழை தொழிலாளர்களான எங்களால் ஒரு பழமொழியை மட்டும் தான் நினைக்க முடியும். எளியோனை வலியோன் தாக்கினால் வலியோனை வாசல் படி தாக்கும் என்று ஒரு பழமொழி உண்டு. அவ்வாறு உங்களை தாக்குவதற்கு ஏதாவது ஒரு வாசற்படியை இறைவன் உருவாக்கி வைக்க வேண்டும் என்று மட்டும் தான் நாங்கள் இப்போது நினைக்க முடியும். எந்த நிலையிலும் பணத்திற்காக பொய் செய்தி வெளியிடும் தாங்கள் எங்கள் ஆட்சேபணையை வெளியிடப் போவதில்லை. என்ன செய்வது? தமிழகத்தில் இம்மாதிரி தரம் தாழ்ந்த பத்திரிக்கைகள் தான் பிரபலமாகின்றன. எனவே எங்களது திருப்திக்கு தங்களுக்கு அனுப்பிய மின் அஞ்சலை எங்கள் இணைய பக்கத்தில் நாங்களே வெளியிட்டுக் கொள்கிறோம். This entry was posted in Blog on July 6, 2018 by admin. அந்நிய நிறுவனங்கள் மட்டும் இன்றி இந்திய தொழில் போட்டியாளர்களும் சேர்ந்து தாது மணல் தொழிலுக்கு எதிராக பொய் பிரச்சாரத்தை கட்டவிழ்த்து விட்டதோடு நீதிமன்றங்களில் வழக்கு விசாரணைக்கு வரும் போது நீதித்துறையை அச்சப்படுத்த அல்லது எதிராக திருப்ப சில ஊடகங்களை பயன்படுத்தி செய்தி வெளியிடுவதை வழக்கமாக கொண்டுள்ளார்கள். அவ்வாறு ரேர் எர்த் தயாரிக்க மட்டுமே உபயோகப்படும் மோனசைட்டில் இருந்து கிடைக்கும் தோரியத்தில் இருந்து அணுகுண்டு தயாரிக்கப்படுகிறது என்று ஒரு அபாண்டமான பொய்யை காசுக்கு வேசி தனம் செய்யும் விகடன் குரூப் தற்போது வெளியிட்டுள்ளது. இதற்கு காரணம் இன்று உயர்நீதிமன்றத்தில் ஒரு வழக்கு விசாரணைக்கு வர இருப்பதும் தொடர்ந்து வழக்கு விசாரிக்கப்படும் என உயர்நீதிமன்றம் கடந்த மாதம் அறிவித்ததும் தான். அதற்கு நமது சங்கத்தின் சார்பில் ஒரு மறுப்பு மின் அஞ்சல் அனுப்பப் பட்டது. காசு வாங்கி கொண்டு பொய் செய்தி வெளியிடும் விகடன் நிச்சயம் நமது மறுப்பை வெளியிட மாட்டார்கள். எனவே உறுப்பினர்களின் தகவலுக்காக அந்த மின் அஞ்சல் கீழே கொடுக்கப்பட்டுள்ளது. “தாது மணல் கடத்தல் அணு ஆயத ஆபத்து – அதிர வைக்கும் ஆவணங்கள்” என்ற தலைப்பில் 04.07.2018- என கடந்த சனிகிழமை தாங்கள் வெளியிட்டுள்ள செய்தி மிகைப்படுத்தி கூறப்பட்ட உண்மைக்கு மாறானது ஆகும். உண்மையில் உலகின் எந்த மூலையிலும் மோனசைட் அணுகுண்டு உற்பத்திக்கோ, அணுமின்நிலைய உற்பத்திக்கோ பயன்படுத்தப்படுவதில்லை. இதில் இருந்து கிடைக்கும் தோரியம் கதிர்வீச்சு உள்ளதே தவிர பிளவுபடும் பொருள் (களைளடைந) அல்ல. எனவே அதனை எந்த காரணத்திற்கும் உபயோகிக்க முடியாது. நாளது தேதியில் உலகின் எந்த நாட்டிலும் இந்த மோனசைட்டில் இருந்து கிடைக்கும் தோரியம் அணுமின் நிலையத்திற்கோ அல்லது அணுகுண்டு செய்யவோ உபயோகப்படவில்லை. இந்தியாவில் மட்டும் தான் இதனை அணுமின் நிலையத்திற்கு இரண்டாம் உப பொருளாக மாற்றி உபயோகிக்கலாமா என ஆராய்ச்சிகள் நடந்து வருகின்றன. 2080 வாக்கில் வெற்றி பெற வாய்ப்பு இருப்பதாக கூறப்படுகிறது. இது அனைத்தும் உங்களுக்கு தெரிந்தாலும் கூட வளர்ப்பு நாயை கல்லால் அடித்தால் ஐயோ பாவம் வாயில்லா பிராணியை தாக்குகிறார்கள் என கூறுவதை தவிர்ப்பதற்காக வெறிநாய் என்ற பெயரில் தாக்குவது போல் தாங்கள் இந்த அபாண்டமான உண்மைக்கு புறம்பான குற்றச்சாட்டை கூறி உள்ளீர்கள். இது பத்திரிக்கை தர்மத்திற்கு நியாயம் அல்ல. உண்மையில் உலகத்தில் எந்த நாட்டிலும் இவ்வாறு உபயோகத்தில் இல்லை என்பதும் வெளிநாடுகளிலேயே மோனசைட் இலகுவாக கிடைக்கிறது என்பதும் இந்தியாவில் இருந்து தோரியம் கடத்தல் என பத்திரிக்கைளில் எழுதுவது என்பது உண்மைக்கு மாறானது என்பதையும் பாராளுமன்றத்திலேயே வினா எண் 1872-க்கு பதிலாக 9.3.2016 அன்று தெரியப்படுத்தி உள்ளார்கள். தாங்களும் அதனை இந்திய அரசு இணையதளத்தில் பார்க்கலாம். மேலும் அனைத்து விமான நிலையங்கள், துறைமுகங்கள் மற்றும் நாட்டின் தரைவழி எல்லை பாதைகள் ஆகிய அனைத்திலும் கதிரியக்க பொருட்கள் போக்குவரத்தை கண்டுபிடிக்கும் மின்னணு சாதனத்தை பொருத்தி அவற்றை சுமார் 500-க்கும் மேற்பட்ட காவல்நிலையங்களோடு ஒருங்கிணைத்து வைத்துள்ளதாகவும் எனவே தோரியம் கடத்தப்படுவதற்கு வாய்ப்பே இல்லை என்பதையும் பாராளுமன்றத்தில் அமைச்சர் வினா எண் 896 நாள் 20.12.2017-ல் தெரிவித்துள்ளார். அதனையும் தாங்கள் இந்திய அரசு இணையதளத்தில் பார்க்கலாம். எனவே தங்களது செய்தி உள்நோக்கத்தோடு எழுதப்பட்டது. கடந்த 1995-ம் வருடத்தில் இருந்தே விக்டர் ராஜமாணிக்கம் அவரது முதலாளி தயாதேவதாஸ் ஆகியோர் பல்வேறு பெயர்களில் பல்வேறு புகார்களை எழுதியதோடு மட்டும் இன்றி ஏராளமான ரிட் மனுக்களையும் தாக்கல்; செய்து இருந்தார்கள். இதற்கு முக்கிய காரணம் ஒரு பத்திரிக்கையில் ஒரு நிறுவனத்திற்கு எதிராக செய்தி வெளியிடுவதற்கு அதில் உள்ள ரிப்போர்ட்டருக்கு கொஞ்சம் பணம் கொடுத்து ரூபாய் 5000 செலுத்தி ஒரு பொது நல வழக்கு தாக்கல் செய்து அதில் அபாண்ட குற்றச்சாட்டுகளை கூறினால் தரமற்ற அல்லது விளம்பரம் கிடைக்காத பத்திரிக்கைகள் சூடான செய்தி என முக்கியத்துவம் கொடுத்து போடுவார்கள். சம்மந்தப்பட்ட நபர்களும் ஒரு பத்திரிக்கையில் கால்பக்க விளம்பரம் செய்ய வேண்டும் என்றால் சுமார் 2 லட்சம் கொடுக்க வேண்டும். மாறாக 5000 ரூபாய் பொது நல வழக்கிலும் சில குறிப்பிட்ட ரிப்போர்ட்டர்களுக்கு செய்த சிறிய செலவிலும் மக்களிடமும் அதிகாரிகள் மட்டத்திலும் ஒரு கோபத்தை ஏற்படுத்தலாம் என இம்மாதிரி செய்து வருவது 1995- முதலே நடந்து வருகிறது. பொதுவாக தாது மணல் தொழில் ஏற்றுமதி என்பதால் உள்ளுர் பத்திரிக்கைகளுக்கு விளம்பரம் கொடுக்க வேண்டிய தேவை இருக்காது. ஆனால் தங்களுக்கு விளம்பரம் என்ற பெயரில் மாமூல் வரவில்லை என்பதால் சில பத்திரிக்கைகள் அவ்வப்போது இதனை தாக்கி எழுதுவது வழக்கம். அதே போல் இதற்கென்றே சில ஊடகவியலாளர்களை பணம் கொடுத்து கையில் எடுத்து வைத்திருக்கிறார்கள் என்பதும் நீதிமன்றங்களில் வழக்கு விசாரணைக்கு வரும் போது நீதித்துறையின் மனதில் ஒரு அச்சத்தை ஏற்படுத்த அல்லது ஒரு விலகி ஓடும் எண்ணத்தை ஏற்படுத்த இவ்வாறு எழுதுவது வழக்கம். இதற்கென்றே தயாதேவதாஸ் மட்டும் இன்றி இந்திய தாது மணல் உற்பத்தியாளர்களிடம் தங்கள் வியாபாரத்தை இழந்த அன்னிய நிறுவனங்களும் பெரும் தொகை செலவு செய்கிறார்கள். அதன் வெளிப்பாடே இந்த புகார் மற்றும் பொது நல வழக்கு எல்லாம். தங்கள் கட்டுரையில் முதலில் கூறி இருக்கும் விக்டர் ராஜமாணிக்கம் திரு.தயாதேவதாசால் பல்வேறு வகைகளில் சட்டவிரோதமாக பலன் அடைந்தவர். இந்த கூட்டத்தில் சில ஓய்வு பெற்ற ஐஏஎஸ் அதிகாரிகளும் உண்டு. இவர்கள் வாங்கும் பணத்திற்காக தவறுதலாக பிரச்சாரம் செய்வார்கள். இது பற்றிய விபரங்களை தாங்கள் http://www.beachminerals.org/video-home/ வீடியோவில் பார்க்கலாம். திரு.வி.சுரேஷ் என்பவர் இப்போது அல்ல, 2005 முதலே தாது மணல் தொழிலுக்கு எதிரானவர். ஏற்கனவே இந்த தொழிலை நிறுத்த வேண்டும் என மனித உரிமை ஆணைய அமைப்பு (Pருஊடு) என்ற அமைப்பு சார்பில் ஒரு உறுப்பினராக இருந்து அறிக்கை கொடுத்தவர். தாது மணல் நிறுவனங்களுக்கு எதிராக ஏற்கனவே நடந்த ஒரு பொது நல வழக்கில் ஓய்வு பெற்ற ஐஏஎஸ் அதிகாரி சுந்தரம் சார்பில் ஆஜர் ஆனவர். வழக்கறிஞர் சட்டப்படி இந்த விபரங்களை அவரே நீதிமன்றத்தில் சொல்லி இந்த வழக்கில் இருந்து விலகி இருக்க வேண்டும். ஆனால் துரதிஷ்டவசமாக அவரும் சொல்லவில்லை. நீதிமன்றமும் இதனை கவனிக்கவில்லை. திரு.சுரேஷ் கொடுத்த அறிக்கை என்பது இந்த தாது மணல் தொழிலையும், ஆற்று மணல் போல் சுவாகா செய்ய வேண்டும் என நினைத்து செயல்பட்ட நிழல் உலக அரசின் உறவினரான திரு.கருணாகரன் என்பவர் கொடுத்த ஒரு தலை பட்சமான அறிக்கையின் அடிப்படையிலும், ஏற்கனவே விவி மினரல் நிறுவனத்தோடு சேரன்மகாதேவி சார் ஆட்சியராக இருக்கும் போதே முன்பகை உள்ள திரு.ககன்தீப்சிங் பேடி என்பவர் கொடுத்த ஒரு தலைபட்சமான அறிக்கையின் அடிப்படையிலும் தயாரிக்கப்பட்டது. கருணாகரன் சட்டவிரோதமாக தான் செயல்பட்டார். சட்டப்படி விசாரணை தேதியை தெரிவிக்காமல் ஒரு தலைபட்சமாக உத்தரவு பிறப்பித்தார். மேலும் அவருக்கு அதிகாரமே பகிர்ந்தளிக்கப்படவில்லை என அரசு தெரிவித்த ஆதாரம் உட்பட அனைத்து ஆதாரங்களும் www.beachminerals.org என்ற இணையதளத்தில் உள்ளது. அதனை தாங்கள் பார்க்கலாம். எந்த நிலையிலும் ஏற்றுமதி தடை செய்யப்படவில்லை. மாறாக சுரங்க பணி செய்வது நிறுத்தி வைக்கப்பட்டு இருந்தது. ஏற்கனவே குவாரி செய்த கனிமங்கள் ஏற்றுமதி செய்யப்பட எந்த தடையும் கிடையாது. ஏற்றுமதி மாநில அரசின் கட்டுப்பாட்டில் வராது என்பது உங்களுக்கு தெரிந்தாலும் கூட உள்நோக்கத்தோடு தாங்கள் இதனை எழுதி உள்ளீர்கள். திரு.சாகு குழுவின் அறிக்கையிலும் வேண்டும் என்றே சில இனங்களை மறைத்து திரித்து கூறி உள்ளார். அதாவது உங்கள் நிர்வாக பத்திரிக்கைக்கு வளர்ச்சிக்காக, செய்திக்காக எப்படி சகாயம் விசாரணையை நடத்தி இறுதியில் சிபிஐ விசாரிக்க வேண்டும் என அறிக்கை செய்தாரோ அதே போல் பத்திரிக்கைளில் செய்திகளுக்காக சில இனங்களை திரித்துள்ளார். அதாவது அரசு நிறுவனமான இந்தியன் ரேர் எர்த் நிறுவனத்தில் தான் ஏற்றுமதிக்கு என வைக்கப்பட்டுள்ள கார்னட், இல்மனைட் கனிமங்களில் மோனசைட் 0.25 சதவீதத்திற்கு கூடுதலாக இருந்தது என்பதை தெரிவிக்காமல் பொதுப்படையாக சில நிறுவனங்கள் என தெரிவித்துள்ளார். அதே போல் சில தனியார் நிறுவனங்களில் செமி பிராசஸ்டு கனிமங்களில் உள்ள மோனசைட்டை அதிகப்படுத்தி காட்ட வேண்டும் என்றும் அவற்றை பிராசஸ்டு கனிமங்களில் அதிகம் இருக்கிறது என வேண்டும் என்றே காட்டினார். இவை அனைத்தையும் தயார் செய்வது திருநெல்வேலியில் உள்ள தங்கமுனியசாமி என்னும் ஒரு துணை இயக்குனர் தான். நாளது தேதியில் அனைத்து துறைமுகங்களிலும் ஸ்கேனர் வசதி பொறுத்தப்பட்டு விட்டதால் 0.25 சதவீதம் என்ற லிமிட் எதுவும் அமுலில் இல்லை. இதனை அணுசக்தி துறை மற்றும் அணு கனிம இயக்குனரகம் உறுதி செய்துள்ளது. உண்மையில் மாவட்ட ஆட்சியர் கருணாகரன் அறிக்கையும், ககன்தீப் சிங் பேடி அறிக்கையும் சாகுகமிட்டி ஆய்வறிக்கையும் சட்ட விதிகளில் கூறியபடியும் இந்திய அரசு வகுத்துள்ள நெறிமுறை படியும், உச்சநீதிமன்றம் வகுத்துள்ள நெறிமுறை படியும் சம்பந்தப்பட்ட நிறுவனங்களுக்கு அறிவிப்பு அனுப்பி அவர்களது முன்னிலையில் அளவீடு மேற்கொண்டு தயாரிக்கப் பட்டது அல்ல. ஒரு தலை பட்சமாக ஆற்றுமணலை போல் தாதுமணலையும் சுவாகா செய்வதற்காக தயாரிக்கப் பட்டது. ஆற்று மணலும் முன்பு இது போல் ஒரு அறிக்கை வாங்கி தான் அரசு நடத்துவோம் என எடுத்தார்கள். இப்போது அங்கு நடப்பது என்ன என்பது அனைவருக்கும் தெரியும். அதற்காக தயாரிக்கப் பட்ட ஒரு தலைபட்சமான அறிக்கை. அதே நேரத்தில் மத்திய அரசு அதிகாரிகளும் மத்திய மாநில அரசு அதிகாரிகளும் பல்வேறு முறை கூட்டு புலத்தணிக்கை, ஆய்வு, பரிசீலனை மேற்கொண்டு எந்த தவறும் இல்லை என்பதை பலமுறை அறிக்கை செய்துள்ளார்கள். அவையும் மேற்கண்ட இணைய தளத்தில் இருக்கும். பார்க்கலாம். மேலும் விவி மினரல் நிறுவன பணியாளர்கள் தனியாக http://vvmemp.blogspot.in என்ற இணையதளம் வைத்துள்ளார்கள். அதிலும் இம்மாதிரி ஏராளமான அறிக்கைகள், உண்மைகள் பதிவிடப்பட்டுள்ளன. அதனையும் பார்க்கலாம். சாகுகமிட்டியின் தவறுகள் நீதிமன்றத்தில் சம்பந்தப்பட்ட நிறுவனங்களால் சுட்டிக்காட்டப்படும். நிறுவனங்களுக்கு எதிராக எழுதுவதற்கு மட்டுமே பணம் பெற்ற விகடன் போன்ற பத்திரிக்கைகள் நிச்சயம் அதனை எழுதாது. இருப்பினும் இது ஏராளமான தொழிலாளர் வாழ்க்கை சம்பந்தப்பட்டது என்பதால் இந்த உண்மைகளை உங்கள் கவனத்திற்கு கொண்டு வருகிறோம். தாது மணல் தொழில் நிறுத்தத்தால் மாநில அரசுக்கு ஆண்டுக்கு சுமார் 780 கோடி ரூபாய் இழப்பீடு. மத்திய அரசுக்கு சுமார் 2000 கோடி ரூபாய் அந்நிய செலவானி இழப்பீடு. நேரடி மறைமுக வேலைவாய்ப்பு பெரும் சுமார் 50000 தொழிலாளர்கள் இதில் பாதிக்கப்பட்டு உள்ளார்கள். எனவே தயவு செய்து மனசாட்சியோடு உண்மையை மட்டும் எழுதுங்கள். இன்று வழக்கு விசாரணைக்கு வருவதற்காக இரண்டு தினங்களுக்கு முன்பு செய்தி வெளியிட்டீர்கள். வழக்கமாக வழக்கு விசாரணைக்கு சில தினங்களுக்கு முன்பு திருமதி சந்தியா ரவிசங்கர் என்பவர் தான் இவ்வாறு செய்தி வெளியிடுவார். கடந்த விசாரணையோடே தங்களை செய்தி வெளியிட எல்லாம் செய்து விட்டோம் என ஒரு தரப்பினர் கொக்கரித்தனர். ஆனால் இந்த முறை அது வந்துள்ளது. நாங்கள் தொழிலாளர்கள் என்ன செய்ய முடியும். உலகை காக்க வந்த ஏசு பிரானையே 30 வெள்ளி காசுக்காக காட்டி கொடுக்க ஆட்கள் இருக்கும் போது பணத்திற்காக எழுதுவதற்கு பத்திரிக்கை நண்பர்களா இருக்க மாட்டார்கள்? தயவு செய்து எங்கள் மனவேதனையை தங்கள் பத்திரிக்கையில் வெளியிட கேட்டுக் கொள்கிறேன். This entry was posted in Blog and tagged beach mining, Illegal Mining. Sahoo Committe, Junior Vikatan, Monazite, Thorium, vikatan, vv mineral on July 2, 2018 by admin. சூறையாடப்படும் ஆற்று மணல்!!! இதே நிலை நீடித்தால் தமிழகம் சுடுகாடாகி விடும்!! ஆற்று மணல் கொள்ளையை மறைக்க மற்றவர்கள் மீது திட்டமிட்டு புகார்!! காவிரி, பாலாறு என தமிழகத்திலுள்ள எல்லா ஆற்றிலும் மணல் சுரண்டப்படுகிறது. இப்படி எடுத்தால் ஆற்றிலிருந்து ஏரி குளம் குட்டைகளுக்கு கால்வாயில் எப்படி தண்ணீர் செல்லும். அருகில் உள்ள மாநிலங்கள் அவர்கள் ஆற்று மணலை பாதுகாப்பாக காப்பாற்றுகிறார்கள். நம் மாநில அரசோ ஆயிரக்கணக்கான லாரிகளில் கேரளாவிற்கும், கர்நாடகாவிற்கும், ஆந்திராவிற்கும், மாலத்தீவிற்கும் பிற வெளிநாடுகளுக்கும் லாரியில், ரயிலில், கப்பலில் பேராசை பிடித்த அரசியல், அதிகாரவர்க்கத்தினால் விற்று காசாக்கி கொள்ளையடிக்கப்படுகிறது. என்ற நீதிமன்ற உத்தரவை மதிக்காமல் தமிழக இயற்கை வளங்கள் வரைமுறையின்றி 40, 50 அடி ஆழம்வரை சுரண்டி அழிக்கப்படுகிறது. ஒரு நாளைக்கு தமிழக ஆறுகளிலிருந்து எடுக்கப்படும் மணல் 90,000-யிரம் லாரி லோடுகள். ஒரு செ.மீ மணல் உருவாக 100 ஆண்டுகளும், ஒரு அடி மணல் உருவாவதற்கு பல நூற்றாண்டுகளும் ஆகின்றன என்கிறது அறிவியல் ஆய்வுகள். அரசு 3 யூனிட் கொண்ட ஒரு லாரி மணல் 945 என விலை நிர்ணயித்திருந்தாலும் அதன் உண்மையான விற்பனை விலையாக ரூ.15 ஆயிரம் முதல் 40 ஆயிரம் வரை உள்ளது. இந்த விலையை தீர்மானிப்பவர்கள் மணல் கொள்ளையர்கள் மட்டுமே. தமிழ்நாட்டில் எடுக்கப்படும் ஆற்றுமணல் அனைத்தும் தமிழகத்தின் கட்டட வேலைக்கு மட்டும் பயன்படுத்தப்படுவதில்லை. இவர்கள் சுரண்டும் ஆற்றுமணல் அளவிற்கும், தமிழ்நாட்டில் நடைபெற்று வரும் கட்டிட வேலைகளுக்கும் மிகப்பெரும் இடைவெளி உள்ளது. தமிழகத்தில் அள்ளப்படும் ஆற்றுமணல் வெளிமாநிலங்களுக்கும், வெளிநாட்டிற்கும் கூட கடத்தப்பட்டு வருகிறது. கேரளத்தில் பல இடங்களில் காவிரி, அமராவதி, தாமிரபரணி ஆற்று மணல் கிடைக்குமென பெயர்ப்பலகைகள் தொங்குகிறது. மாலத்தீவு உட்பட பல வெளிநாடுகளுக்கு ஆற்று மணல் கடத்தப்படுகிறது. மாலத்தீவுக்கு கொண்டு செல்லப்படும் ஆற்று மணலின் அளவு ஆண்டிற்கு 11 லட்சம் டன்னாகும். இயற்கையின் மடியில் பாலைக் குடிப்பதற்கு பதிலாக இயற்கையின் மடியையே அறுத்து ரத்தம் குடிக்கும் இக்கொள்ளையர்களால் தமிழகத்தின் ஆற்று வளமே அழிந்துவிட்டது. ஆற்றின் நீர்மட்டமே தாழ்ந்துவிட்டது. ஆற்றில் எங்கு கைவைத்து தோண்டினாலே தண்ணீர் வரும் என்ற நிலை அழிந்தே போய்விட்டது. ஆறுகளில் ராட்சச இயந்திரங்களை வைத்து மணல் அள்ளக்கூடாது என உயர்நீதிமன்றம் 2010, 2012, 2013 ஆண்டுகளில் பல்வேறு தீர்ப்புகளை கொடுத்திருந்தாலும் அது எதுவும் மணல் கொள்ளையை தடுக்க உதவவில்லை. 10 லட்சம் கோடி ரூபாய் அளவுக்கு ஆற்று மணல் அள்ளியதில் முறைகேடு நடைபெற்றுள்ளது. -காலை 7 முதல் மாலை 5 மணி வரைதான் மணல் எடுக்க வேண்டும். -தமிழக அரசின் சிறப்பு அனுமதி பெற்றுதான் பொக்கலைன் பயன்படுத்த வேண்டும். -நிலத்தடி நீர் பாதிப்பு ஏற்படுமா, மணல் அள்ள அனுமதிக்கலாமா, வேண்டாமா என பொதுப்பணித்துறை, சென்னையில் உள்ள சுற்றுச் சூழல் ஆணையத்திடம் அனுமதி பெற வேண்டும். -மணல் அள்ளுவதில் இரண்டு பொக்கலைன் எந்திரங்கள்தான் பயன்படுத்த வேண்டும். – வாரம் ஒரு நாள் ஞாயிறு அன்று மணல்குவாரி இயங்க கூடாது. -ஒரு மீட்டர் ஆழம் மட்டுமே மணல் அள்ள வேண்டும். -ஆற்றின் கரை ஓரத்தில்தான் அள்ள வேண்டும். –அள்ளபடும் இடம் தெளிவாக தெரியும் வகையில் எல்லைக் கற்கள் நடப்பட்டு, கம்பிவேலி அமைக்கப்பட்டு இருக்க வேண்டும். -இதனால் உள்ளூர் மக்களுக்கு நிலத்தடி நீர், சாலை வசதி, விவசாயம் என எந்த பாதிப்புகளும் வரக்கூடாது. -குவாரி மணல் கொட்டி வைக்கப்படும் இடத்திற்க்கு ஊராட்சி மன்றத்திற்கு வரி செழுத்த வேண்டும். -குவாரி மணல் கொட்டி வைக்கப்பட்டு எடுக்கப்படுவதால் அதற்க்கு வருமானவரி துறையிடம் செகண்ட் சேல்(second sals) வரி செழுத்த வேண்டும். – இதை கண்காணிப்பதற்காக 2006 -இல் உயர்நீதிமன்றம் மாவட்ட ஆட்சியர் தலைமையில் மாவட்ட அளவில் சிறப்புக் குழு, தாசில்தார் தலைமையில் வட்ட அளவில் சிறப்புக் குழு என அமைத்து இயங்க வேண்டும் எனவும்,மாதம் ஒருமுறை இக்குழு கூடி கனிமவள முறைகேடு பற்றிய புகார்களை விசாரிக்க வேண்டும், எனவும் உத்தரவு இட்டு இருக்கிறது. இவை அனைத்தும் சட்டமாக தாள்களில் மட்டும் உள்ளது.இதை அதிகாரிகள், அரசு யாரும், எங்கும் நடைமுறைப் படுத்துவதில்லை. மக்கள் போராட்டங்களை நசுக்கும் கலையை மணல்கொள்ளையர்கள் தெளிவாக வரைபடம் போல் வரையறுத்து வைத்து உள்ளனர். முதலில் அப்பகுதியில் உள்ள அனைத்து அரசியல்கட்சி தலைவர்களையும், அதிகாரிகளையும், மக்கள் பிரதிநிதிகளையும் தேவையானதைக் கொடுத்து விலைக்கு வாங்குவது. பின்பு அப்பகுதியில் பாதிப்புக்கு உள்ளாக இருக்கும் மக்களை நல்ல வேலைவாய்ப்பு என கூறி அழைத்து வேலை கொடுப்பது. பின்பு அவர்களை வேலைக்கு வர வேண்டாம் எனக் கூறிவிட்டு வீட்டில் சும்மா இருங்கள் உங்களுக்கு மாத மாதம் சம்பளம் வரும் எனக் கூறி ஜேசிபி, பொக்லைன், ஹிட்டாசி கருவிகளை வைத்து மணல் அள்ளத் தொடங்குவது. அப்பகுதியில் உள்ள மக்களிடம் எதிர்ப்பு வராமல் இருக்க ஒரு ரேஷன் அட்டைக்கு என சில மாதங்களுக்கு ஒருமுறை 5000, 10000 என பணம் கொடுப்பது. ஊரில் கோவில்கட்ட, கும்பாபிஷேகம் நடத்த, பள்ளி மராமத்து, விளையாட்டு போட்டிக்கு பணம் – பரிசுகள், ஊரில் நடக்கும் நாடகம் , தெருக்கூத்து , கலைநிகழ்சிகளுக்கு பணம் கொடுப்பது, முன்னணியில் நிற்பவர்களுக்கு பல லட்சம் பணம் என பணத்தை அருவி போல் கொட்டி அவர்களை விலைக்கு வாங்குவது என்பது நடக்கும். இதற்கும் மசியாமல் மக்களோ, தனிநபரோ, இயக்கமோ போராடினால் ஒவ்வொரு ஊரிலேயேயும் மக்களிடம் பிளவை உருவாக்கி சமூக பதட்டத்தை ஏற்படுத்துவது, ஊர் மோதல் ஏற்படுத்துவது, சாதி மோதல் ஏற்படுத்துவது, மாத மோதல் ஏற்படுத்துவது, மக்களையே ஒருவரை ஒருவர் தாக்க செய்வது, உள்ளூரில் விலைக்கு வாங்கிய தனது ஆதரவாளர் மூலம் தனக்கு எதிரானவர்கள் மீது பொய்வழக்குகளை தொடர்ந்து கொடுக்க வைப்பது என்பதை நடத்துவார்கள். மேலும் போராட்ட தலைவர்களை விலைக்கு வாங்க முடியாவிட்டால் அவர்களைப் பற்றி பல்வேறு பொய்யான அவதூறுகளை மக்களிடம் கட்டவிழ்த்து விடுவது அதன் மூலம் மக்களிடையே அவர்கள் மீது நம்பிக்கையின்மையை ஏற்படுத்துவது என்பதும்: சில நேர்மையான அதிகாரிகளுக்கு மேல் அதிகாரி மூலம் அச்சுறுத்தல், மிரட்டல், அதற்க்கும் அடிபணிய மறுத்தால் பணிமாற்றம் என்பதும் நடக்கும். மேலும் மணல்குவாரியை எதிர்ப்பவர்களுக்கு மறைமுக மிரட்டல், குடும்ப உறவுகள்-நட்பு வட்டம் மூலம் நெருக்கடி, குடும்ப உறவுகள்-நட்பு வட்டதிதிற்க்கு மணல் எடுக்க வாகன வாய்ப்பு, தொழில் ஏற்பாடு செய்து போராட்ட முன்னணியினரை செயலிழக்க செய்வது, அரசு பணியில் யாராவது உள்ளூரில் இருந்தால் போராட்டத்தில் தொடர்பு எனக் கூறி இடைநீக்கம் (சஸ்பெண்டு) செய்வது-இதன் மூலம் மக்களை மிரள வைப்பது, உள்ளூர் அதிகாரிகள் மூலம் மிரட்டல், பின்பு காவல்துறையினரே களத்தில் இறக்கப்படுவார்கள். சட்டத்தைக் காக்கிறேன் என்பதன் பெயரில் உன்னைப் பற்றி புகார் வந்துள்ளது எனக் கூறி மிரட்டல், காவல்துறை மூலம் பொய்வழக்கு , காவல்துறை மூலம் தாக்குதல், காவல்துறையின் பொய்வழக்கு மூலம் சிறை, சித்திரவதை, நீதிமன்ற விசாரணை என்பது தொடர்ந்து நடக்கும். சில நேரங்களில் மணல்குவாரியை எதிர்ப்பவர்களை கூலிப்படை வைத்து கொலை செய்வது, ஆளே இல்லாமல் செய்து விடுவது என்பதும் நடக்கும். இப்படி எண்ணற்ற சாம, பேத, தான, தண்ட முறையிலேதான் போராடும் மக்களையும், போராட்ட தலைவர்களையும், சில நேர்மையான அதிகாரிகளையும் மணல்குவாரி நடத்துபவர்களால் இப்படி கவனிக்கப்படுவார்கள். இதற்கு பல உதாரணங்கள் உண்டு. வருவாய்துறை தாசில்தார் காஞ்சிபுரம் வெங்கடேசன் , காவல்துறை ஏட்டு அரக்கோணம் கனகராசு , பல்வேறு சமூக சுற்றுசூழல் ஆர்வலர்கள் மானுர் தனிகாச்சலம், புதுக்கோட்டை கார்த்திக் மற்றும் ராஜேஷ், திசையன்விளை சதீஷ்குமார், திருவைகுண்டம் சாம் தேவசகாயம் போன்ற ஊர்தலைவர்கள், தோழர் நெல்லை வீரவநல்லுர் சுடலைமுத்து போன்ற அரசியல் இயக்கம் சார்ந்தவர்கள் என பலரும் மணல் கொள்ளையை தடுத்ததால் கொலை செய்யப்பட்டுள்ளனர். ஆட்சியர் சகாயம் போன்றவர்களே மணல்கொள்ளையர்களால் காஞ்சிபுரத்தில் பணியாற்றி வந்த போது கொலைவெறி தாக்குதலுக்கு உள்ளாகி உயிர் தப்பித்த நிகழ்வுகளும் உண்டு. நம்மையில்லாம் எங்கு கொண்டுபோய் நிறுத்துமோ இந்த கொள்ளைகள்..!!!! This entry was posted in Blog on June 22, 2018 by admin. தாது மணல் தொழிலுக்கு எதிராக வேண்டும் என்றே தவறாக திட்டமிட்டு பொய் பிரச்சாரம் செய்யப்படுகிறது. இது பொது மக்களின் கவனத்தை திசை திருப்புவதற்காக சில நிழல் உலக மணல் மாபியாக்களால் அரசின் ஆதரவோடு செய்யப்படுகிறது. தமிழக அரசு ஒரு லோடு மணலை ரூபாய் 700 என நாங்கள் விற்பனை செய்கிறோம். கடந்த ஆண்டு அரசுக்கு 89 கோடி ரூபாய் வருமானம் வந்துள்ளது என மத்திய அரசுக்கு ஒரு அறிக்கை அனுப்பி உள்ளது. ஆனால் உண்மையில் நடப்பது பொதுப்பணித்துறை என்ற பெயரில் முன்பு சசிகலாவின் உறவினரான திவாகரன் மற்றும் அவரது கூட்டத்தால் ஆற்று மணல் சூறையாடப்பட்டது. தற்போது இது போல் நிழல் உலக அரசு தாதாக்களால் ஆற்று மணல் சூறையாடப்படுகிறது. ஒரு ஆண்டுக்கு 200 நாட்கள் மட்டும் ஆற்று மணல் எடுக்கப்பட்டால் குறைந்த பட்சம் வருடத்திற்கு 24 ஆயிரம் கோடி ரூபாய் ஆற்றில் இருந்து சுரண்டப்படுகிறது. அப்படியானால் வருடம் முழுவதும் ஆற்று மணல் எடுக்கப்படும் போது வருடத்திற்கு 40000 கோடி ரூபாய் சுரண்டப்படுகிறது அல்லவா? இது வெளியே தெரியாமல் இருக்க சில ஊடகங்களுக்கு மாமூல் கொடுத்து பொது மக்கள் இதனை பற்றி விழிப்புணர்வு அடையாமல் இருப்பதற்காக பொது மக்கள் மற்றும் தன்னார்வலர்களின் கவனத்தை திசை திருப்ப அரசு அதிகாரிகளால் திட்டமிட்டு நடத்தப்பட்ட நாடகம் தான் தாது மணல் கொள்ளை என்பது. இதோ ஆற்று மணலில் எவ்வளவு கொள்ளை என்பதற்கான பட்டியல் கீழே கொடுக்கப்படுகிறது. This entry was posted in Blog and tagged beach mineral, illegal mining, Monazite, river sand, Thorium, vaikundarajan, vv mineral on June 20, 2018 by admin.